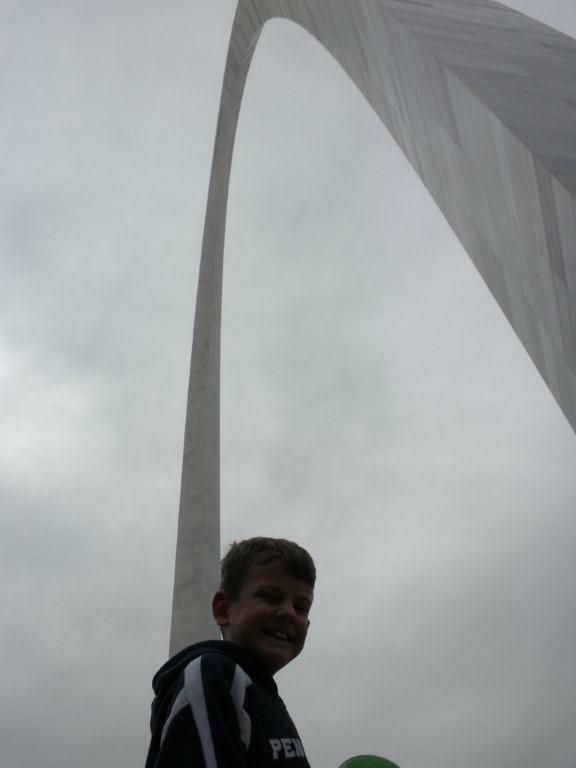 On Friday, Oct. 9 my wife, son, and I flew into St. Louis and drove the 105 miles or so to Springfield, Il. They treated me to the trip for my birthday coming up at the end of November. It’s one of those milestone birthdays – we usually celebrate on a much smaller scale. We got in kind of late, and stayed Friday night out by the power plant, but not so bright and early Saturday morning we hit the road for downtown Springfield. We had a room at the Hilton, just a couple of blocks from, well, just about everything as far as Lincoln is concerned. 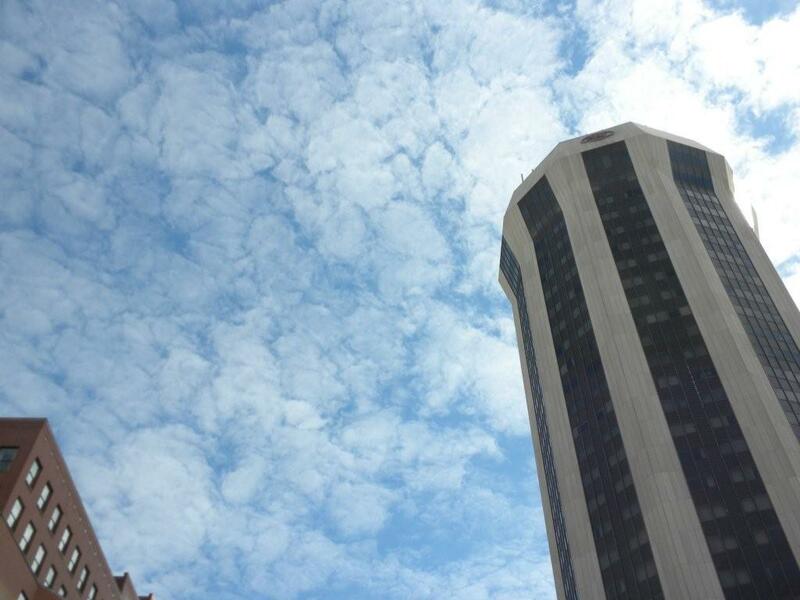 You can’t miss the Hilton, which is by far the tallest building in town (we stayed on the 27th floor). Click on the thumbs for larger images. 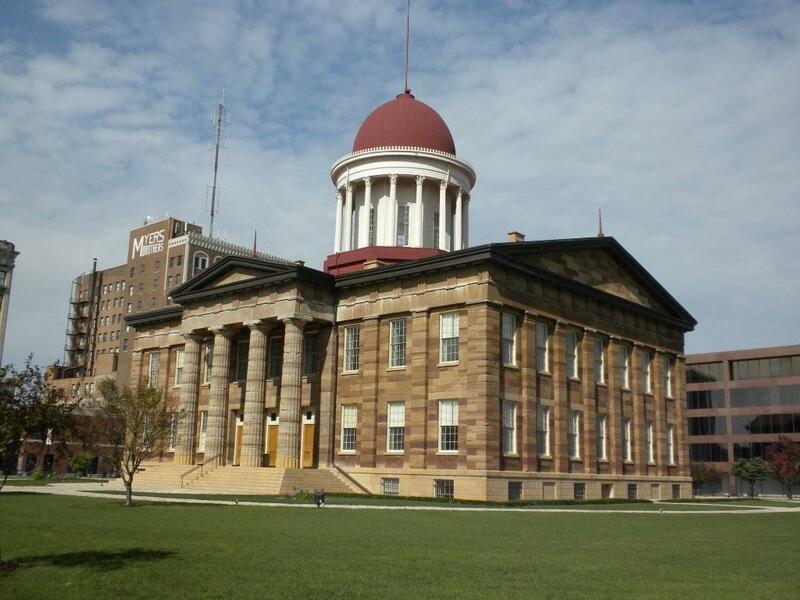 …and of the Old Capitol that sits right across the street (Adams Ave., which has been closed off into a sort of mall). 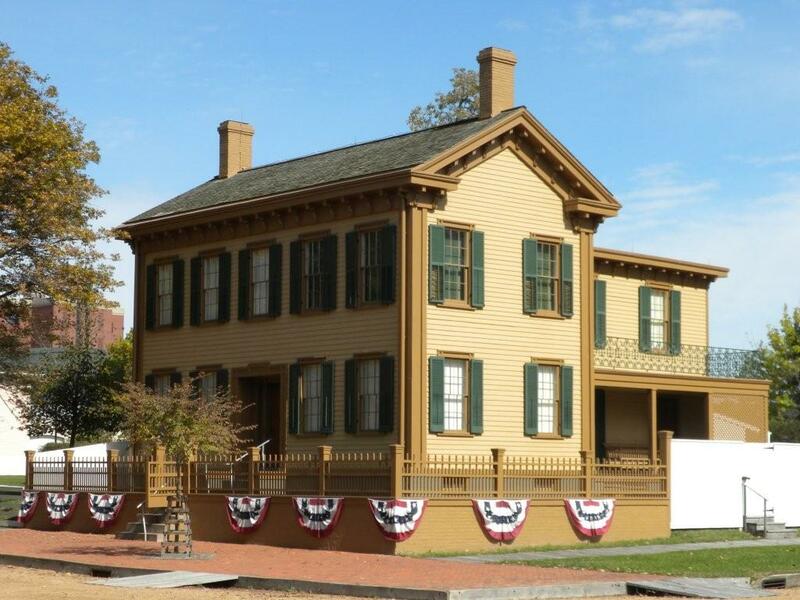 At this point we decided to walk another couple of blocks to the Lincoln Home National Historic Site and a tour of, well, Lincoln’s home. Then it was back to the law offices, after a quick stop in the Tinsley Dry Goods store to enquire about the evening’s ghost tour. It was already unseasonably cold and was only going to get colder, so we adopted a wait and see attitude. Tinsley Dry Goods is one of those artsy/crafty type places, which means the wife browsed a little longer than was expected. Right next to Tinsley’s are the Law Offices, and we entered just in time for the tour. 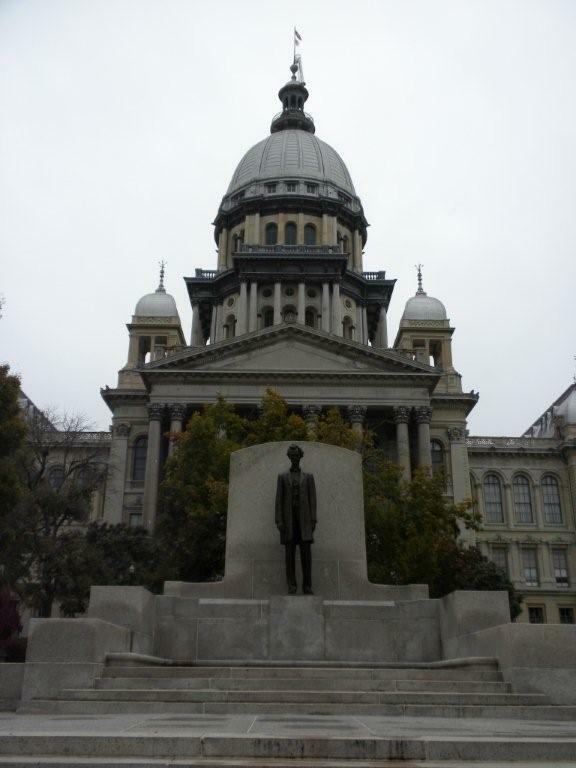 Afterwards, we strolled through the Capitol, a beautifully preserved building. We ate, watched some football, and around 6:30, while we were still in the restaurant, all the power within about a 2 mile radius of the capitol building went out. Remember, all our stuff is on the 27th floor. There were also two wedding receptions under way in the hotel. After about half an hour of this chaos, we jumped in the car and headed for Hooters to watch more football, opting not to freeze to death on a ghost tour. After the museum, we walked through the Springfield Visitor Center, housed in an old,though not Lincoln old, train station (see it in the image above, the reddish building in the mid-upper left). 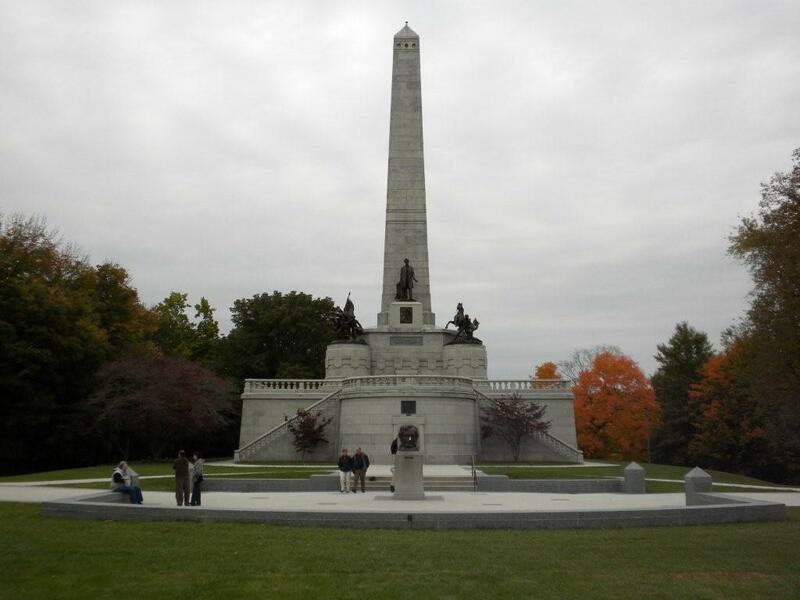 Then it was a quick walk back to the car and a pretty short drive to Oak Hill Cemetery where the Lincoln Tomb was…closed due to state budget constraints. Then we spent some time in the little gift shop that’s been sitting at the entrance to the cemetery for about 70 years, and afterwards went to a seafood house for dinner. On Monday morning before driving back to St. Louis for our 3:00 PM flight home, I dropped the wife off at the ALPLM gift shop and the boy and I drove over to the current capitol building to check out the statuary there. Then we picked up the wife, drove back to St. Louis, made a quick (very quick) stop at the arch – for some odd reason the NPS is under the impression that the Lewis & Clark expedition began in St. Louis, when we all know it started in Pittsburgh – and arrived at the airport with about 15 minutes to spare. OK, don’t worry (or do worry, depending on what you think of my writing and photography). I have a lot of pictures and comments on the sites we visited and the sights we saw, and will post them here as I get to them. Stay tuned. Congratulations, Harry, on the birthday and the trip. Hmm, I suppose the opposite of belated wishes would be premature ones? Thanks Don. And these days, I’d say any birthday wishes prior to the actual date would definitely be premature. Love the story so far. 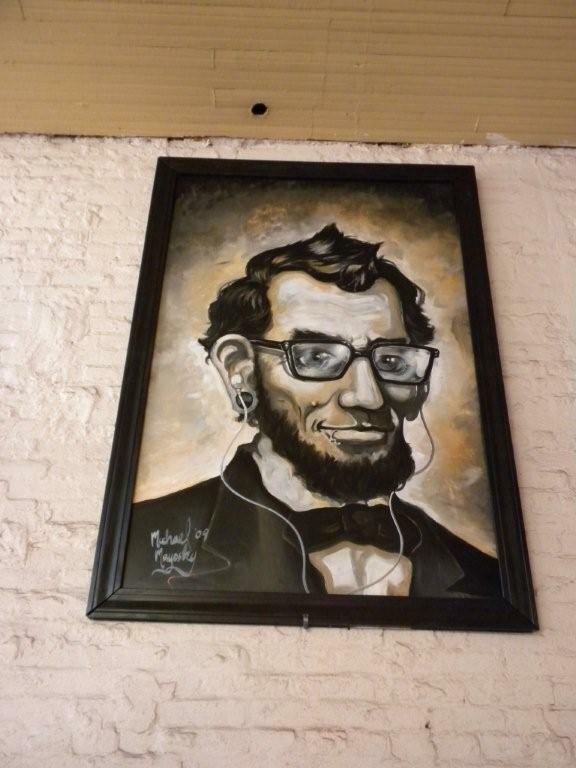 At least you got to see the bust of Lincoln at his tomb. When a bunch of us were there a year ago it was all fenced in and covered up as they were doing restoration work. We could not go to the Herdon /Lincoln office as it was only open on Saturday and that was the day Obama was on the state house steps to annouce his running for President. 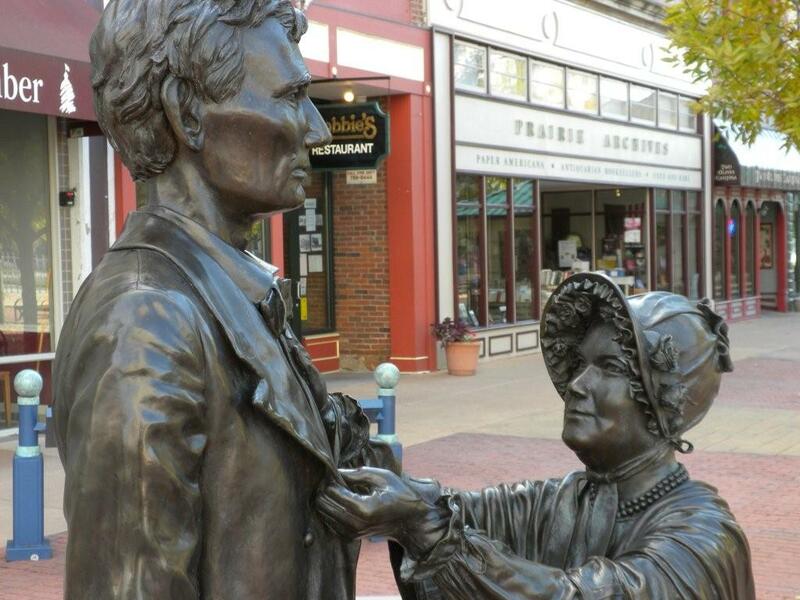 Do you go to the bookstore that is there behind the statue of Lincoln and Mary on Adams street . It is just down from the law office. You should have seen the group have a feeding freenzy there !!! Keep the story coming . Did n’t Lewis and Clark start at Monticello? I did go to that bookstore, where I finally found H. L. Mencken’s “The American Language” (I’ve had the two supplements for a while). Prairie Archives – you can see it in the background of the image of Mary and Abe’s statues. Restoration work still going on at the tomb – couldn’t go up on the top deck. And couldn’t get into the tomb itself. Now I have a reason to go back – that and New Salem. Lewis and Clark started in Pittsburgh, where they had special collapsible boats made. They headed down the Ohio, and got hung up for a while on a “freshet” out around Sewickley, I think. Great article so far…glad you got to so many sites, I am just sorry to see that due to our messed up government here in Illinois you did not get into some of them. I am looking forward to your pics and comments on the individual sites. I’m not dead yet, Corey. Not until the end of November. Hey, y’all, there is actually a lot of historical hairsplitting about the start of the Lewis & Clark expedition. – It started in the brain of Thomas Jefferson (Monticello). – It started in Pittsburgh, where Lewis left with the boats. – It started at Wood River, Illinois, where they actually departed. If you like Lewis & Clark, I have a blog called American Heroes where I post on Lewis & Clark topics almost every day. You can find it at http://franceshunter.wordpress.com. Great post! 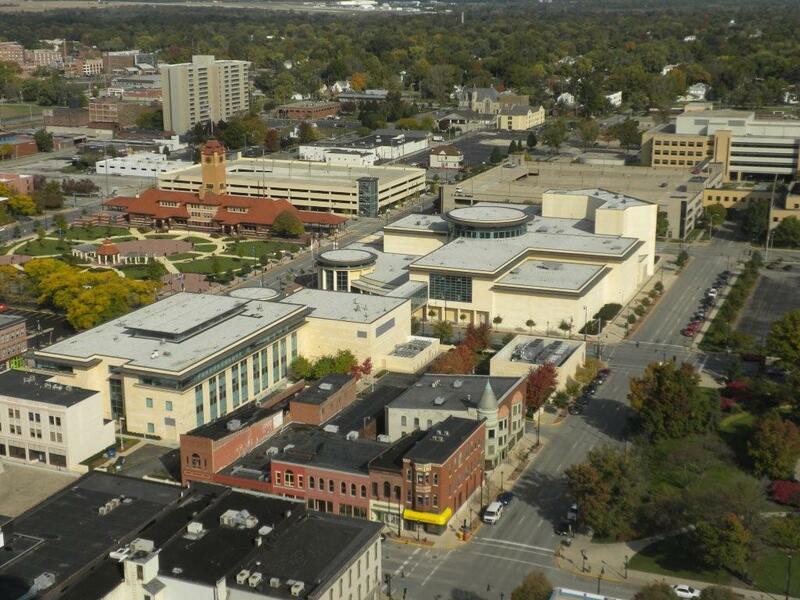 Love seeing these photos of Lincoln’s hometown. What great history! Ohhhh, man, I’d forgotten that was the weekend of the big downtown power outage. I was off, but I’m told that, here at The State Journal-Register (‘Always Abe’s Friend’), our backup generator failed to kick in as well. I guess there was trepidation for at least a while about just how we were going to get the paper out. Sounds like you had a good time — and I’m particularly glad the Prairie Archives visit was a success (no T-shirts, tho?) — but I’ll apologize on behalf of the city for the outage and on behalf of the state for the Tomb. Please do come back; we’ll try not to let it all happen again. I’m looking forward to your further installments. Thanks Mike. Your tips were great. The seafood house was actually in an old house – can’t remember the name just now. I wasn’t aware of t-shirts at the bookstore, though we did pick up a few at the ALPLM for $4 each! A good book on places associated with Lincoln that I meant to mention in my last post is ‘Following in Lincoln’s Footsteps’ by Ralph Gary. Gary has all the places in Illinois covered plus a excellent map and breakdown of the Springfield cemetery. Also. 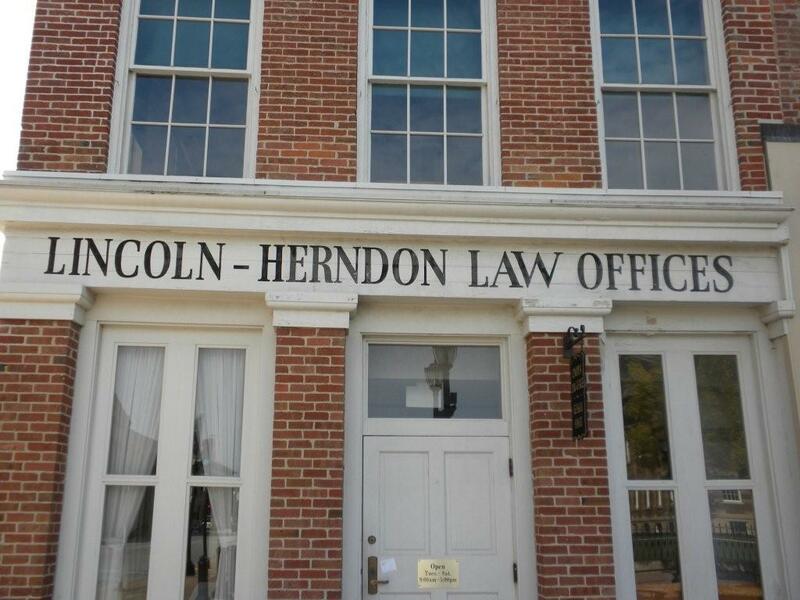 other sites associated with Lincoln throughout the United States are well covered. I purchased the book this year after reading a review of it by Nick Kurtz and I have to say the book is well worth the money as it makes for very interesting reading for all Lincoln buffs.